A lifted truck brings style and added performance to an already brawny RAM truck. Lift kits and leveling kits keep your truck level while providing an off-roading stance and added ground clearance for Lafayette drivers looking for adventure. Learn more about the various methods for lifting your truck before heading out on the open road! 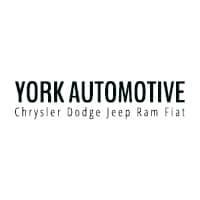 Speak with our certified technicians in our Parts Department about any questions you may have about lift kit options for your RAM truck, or if you know exactly what you’re looking for, you can order your parts online through York Chrysler Dodge Jeep Ram FIAT.